I can think of few hassles as devastating as dropping your cell phone into the sink or letting it take a tumble in the washing machine. These kinds of accidents happen all the time, often with the result of an expensive trip to the store for a replacement. But maybe that doesn't have to be the outcome. A couple years back, we offered some tips for reviving a wet phone, including the ever-popular "submerge it in a bowl of dry rice." 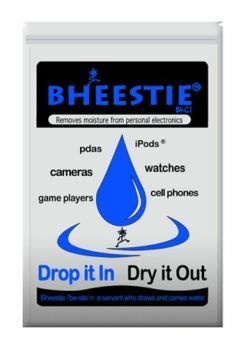 But if you want a more robust solution, consider stocking a Bheestie Bag. I haven't tried a Bheestie Bag myself, as I've managed to keep my phones and other gadgets from taking unintended swims. But the user reviews on Amazon (where the Bheestie sells for $18) are extremely favorable. The catch, of course, is that you really need to buy one in advance, keeping it on hand just in case of water damage. Still, if you're the accident-prone type, you might be better off spending $20 now than hundreds later to replace your device. Reader Fred wants to know if a laptop hard drive can be plugged into a desktop PC. "The pin out appears to be the same," he notes, "but there is no separate power-supply connector." Short answer: yes. Long answer: it depends on a few things. For starters, Fred, you neglected to tell me what kind of drive it is--IDE or SATA--or what kinds of drive(s) you have in your desktop. If I'm right, you can use your laptop drive inside your desktop--but you'll need an adapter. Fortunately, they're cheap; Newegg, for example, has the Rosewill RCW-616 Laptop 2.5" to Desktop 3.5" IDE Hard Drive Adapter Converter for just $5 shipped. It includes the necessary Molex adapter for connecting to your desktop power supply. However, your desktop might not have a drive bay that can accommodate a 2.5-inch drive. If that's the case, there are adapters available. Or you might consider an easier and more versatile solution: an enclosure that turns your old internal laptop drive into an external USB drive. That not only saves you from having to tinker around inside your desktop, but also gives you a drive you can easily use with multiple PCs. Want to know more? I've covered this topic in "Recycle an Old Laptop Hard Drive."